Filing a late tax return might save you tax penalties. 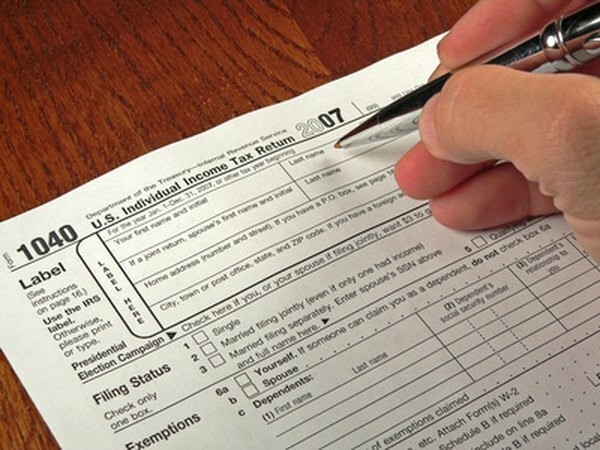 If you forgot to file your tax return, the Internal Revenue Service might file a substitute return for you, perhaps causing you to miss out on qualified tax deductions. It might also assess tax penalties and, in extreme cases, pursue a criminal conviction. If failed to file your tax return on time, you need to file a late return and contact the IRS about any amounts that remain overdue. The IRS imposes two penalties -- the failure to file penalty and the failure to pay penalty. Since the failure to file penalty adds up faster than the failure to pay penalty, it is probably to your advantage to file your return as soon as possible, even if you can't afford to actually pay. Although both of these penalties top out at 25 percent of the overdue amount, if your return is at least 60 days late the minimum penalty is the lesser of $135 or 100 percent of the overdue amount. The IRS also imposes interest on overdue amounts. Normally, tax penalties are based on the amount you owe; if you owe no taxes the IRS will not assess a penalty. The IRS can place a lien on all your property including your real property, personal property, wages and even accounts receivable, if necessary to secure an overdue tax bill. Eventually, it could auction and sell your property. Once a tax lien is in place, even the U.S. Bankruptcy Court lacks the authority to remove it. Although the IRS will notify you before it places a lien, it is important to contact the IRS before you receive notice, to give you maximum time to negotiate. If you fail to file a tax return for a year in which you owe taxes, the IRS can pursue a criminal prosecution against you. The IRS, however, generally won't pursue criminal charges as long as you file or make arrangements to file before the IRS notifies you that you are under investigation. Unless you engage in fraudulent behavior, you cannot be convicted of a crime for failure to file a tax return for a tax year in which you owe no taxes. If you can't pay all your taxes and penalties when you file your overdue return, contact the Taxpayer Advocate Service. The Taxpayer Advocate Service is a division of the IRS that can help you take advantage of programs that can make it easier to pay your taxes. The IRS is likely to approve an installment payment plan if you owe no more than $25,000 including penalties and interest, and it may approve such as plan even if you owe more than that. Alternatively, it may agree to list your debt as "Currently Non-Collectible," a status in which the IRS agrees to temporarily suspend any collection activity. Penalties and interest continue to accumulate under both of these programs. Instead of finding that you owe past due taxes, you may find that your failure to file a tax return caused you to miss a tax refund. You have a three-year period from the due date of your tax return to apply for a tax refund by filing your overdue return. If you miss the deadline, you abandon your refund to the U.S. Treasury. To claim an overdue refund you must file all past due tax returns, not only the return that entitles you to a refund.